Tim Hague Jr is no stranger to races. 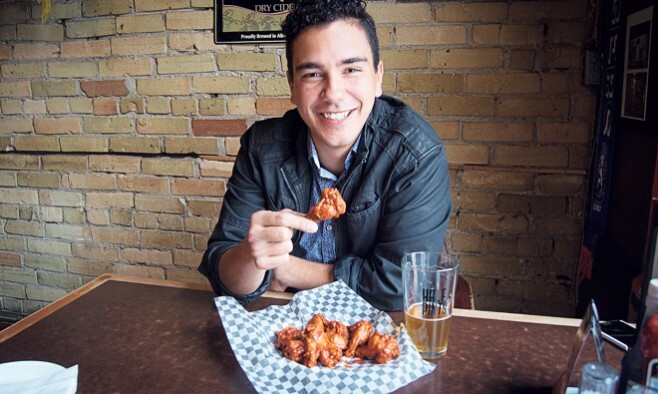 Since winning TV show, ‘The Amazing Race Canada’, the 26-year-old has raised more than C$22,000 for Parkinson’s research from an unlikely source – an epic chicken wing-eating race called ‘Wingin’ It’. 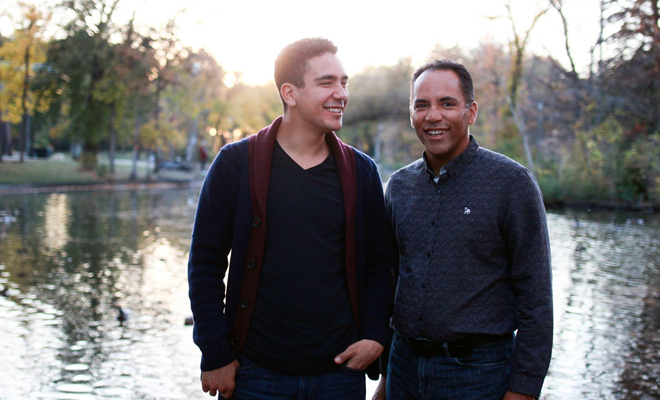 Tim’s accomplice for the TV show happens to be the same person who inspired the food fundraiser – his father, Tim Hague Sr, who was diagnosed with Parkinson’s disease, aged 46. In this exclusive interview, the Winnipeg student tells us about the family impact of diagnosis, why young people are the best fundraisers for Parkinson’s and how his dad bounced back from depression of diagnosis to winning ‘The Amazing Race’. When was your father diagnosed with Parkinson’s? And how did it affect the family? It took some time to wrap my head around it and it was a hard couple of years, for sure. My dad has always been really active but for the first year after diagnosis, he really struggled with depression as he tried to come to terms with it. It was hard to understand and hard to accept as a family. How much of an inspiration is your dad for you? The bounce back he has had since that first year has been truly inspirational. It was incredible to win ‘The Amazing Race’ with him in 2013 and then watch him go on to create a career as a speaker and bring hope to thousands of people living with Parkinson’s. It’s been really fantastic to witness that. It sounds like ‘The Amazing Race’ was a springboard for your dad’s recovery? Definitely! When you win something like that you have to ask how much this really affects your life. The simple answer is, it dramatically affected our lives. It really did give us a confidence to accomplish things that we didn’t necessarily know we could. Everything from ‘Wingin’ It’ to speaking engagements, to just thinking big. It gave us the confidence to step out and do things others may not. The Race was definitely a springboard to launch us into helping other people. How did his career as a speaker for Parkinson’s advocacy come about? We received quite a few requests for speaking after we won ‘The Amazing Race’, which formed a great platform to practice working and speaking together. From that he was able to refine his speaking style. Over the years he has become more focused on his speaking engagements for Parkinson’s, which was a very natural progression. It’s been very cool to see how he has developed into a fantastic speaker after initially training as a nurse. You use the term ‘Parkinson’s fighter’ on your website. Is that the way you view your father? Absolutely. As a family, we know that unless we find a cure, Parkinson’s will eventually take my dad. But living each day in the moment – how you go about fighting that disease – is what’s important. My dad always says, “Parkinson’s may some day take my life, but today is mine”. And that philosophy seeps in to everything we do and the way we live our lives. It’s not a passive approach at all, it’s very much a ‘going out and smacking Parkinson’s’ kind of attitude! 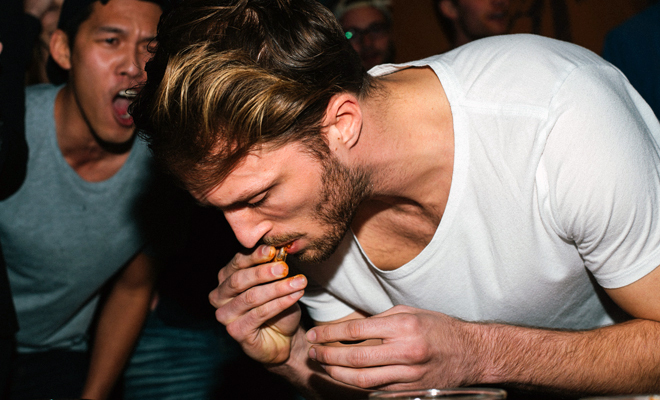 And step one to “smacking Parkinson’s” is to organise your own chicken wing contest, naturally. I must admit I love wings myself, so how did the idea come about? I wanted to create an event my friends and I could get excited about, something that would be an easy ‘yes’ for people my age, between 20-35 year-olds – the demographic that Parkinson’s has a hard time reaching. At the end of the day, the walks are great, the pancake breakfasts are great, but they’re not something I’m going to shout about to all my friends! So that’s really where the wings and beer came from. 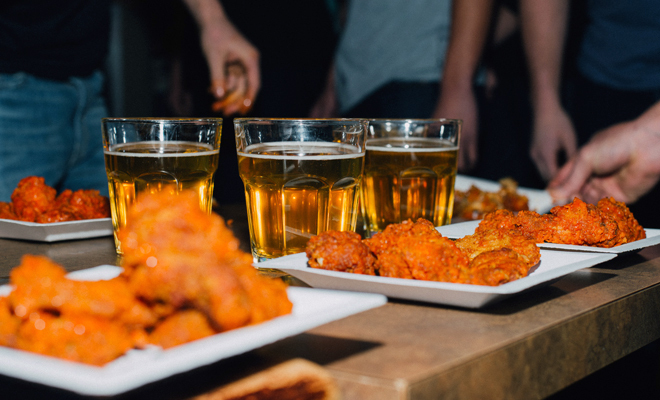 Here in North America, we LOVE our wings and beer. 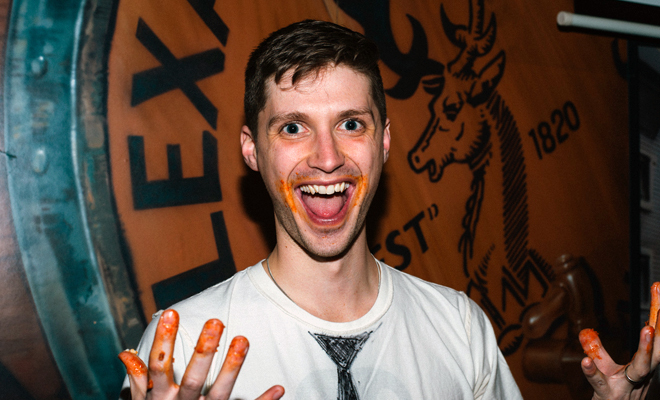 If you go out, it’s always wings and beer – I mean, who doesn’t love wings and beer?! Why are you so keen to get the younger crowd involved? I feel there’s this misconception that if you’re going to have a successful fundraiser, you need to have all these older people there with their chequebooks. Honestly, I wasn’t ok with that idea. I wanted to prove that this younger demographic are passionate about the causes and that we can generate money and help out. We definitely proved that with ‘Wingin’ It’. Do you feel it’s important for younger people to become engaged with Parkinson’s? Oh, absolutely! I always told people, I’m not expecting everyone to be as passionate about Parkinson’s as me. Unless you have personal experience, it’s hard to really appreciate what that person is going through. My advice to people has always been, find something you can be passionate about and give back to that cause. When we as people start giving back to whatever we’re passionate about, that’s when we start becoming a more compassionate society. Of course it’s about raising money and Parkinson’s awareness, but I really do want to encourage a younger generation to start looking beyond themselves and start finding ways to give back. Was it hard getting the word out about ‘Wingin’ It’? Winnipeg, as a city, got all over it! The amount of exposure and support we received was unbelievable. From TV stations, to newspapers and radio, we gained a lot of coverage. Around 250 people showed up at the event – with 20 teams of five – and I knew about a third of them. The majority came from outside my immediate circle, which is what you hope for as an event organiser. Then you’re not just asking your friends to come – it’s people who want to be a part of it, and part of the solution. How did the event go down in the end? People were having so much fun, and were so engaged. It was an absolute blast! It didn’t feel like they were coming out of obligation, but that they actually wanted to be there of their own accord. Also, my dad loved it! It’s so different from any other event out there and everyone really embraced the occasion. The grand prize wasn’t actually for the team who won the wing-eating contest, but the team that raised the largest amount: ‘The Wing Kings’! What was the final amount raised? We’ve done a final count. So after (collectively) drinking over 1000oz of beer and consuming over 800 wings, we raised a total of $22,165.16! It was phenomenal, I couldn’t believe the final number. I was anticipating between $10,000 and $15,000; $20,000 was the dream. The fact we passed that was huge! Which charity are you donating to? All the proceeds went to Parkinson Canada – they’re the national research foundation here in Canada. Further down the line, I would like to disperse the funds a little more. While we’re waiting for a cure, I think there is a lot of work to be done for the ‘right now’ – helping people cope and find ways to fight back today. At the end of the day, we’ve been searching for it so long now that helping people cope and live their lives in a functional, encouraging and positive manner can go a long, long way. My hope is that charities start really focusing on helping people in the now. What next for ‘Wingin’ It’? Do you have other bigger plans? That’s the million-dollar question. We will do it again next year, and keep it largely the same. Over the next year we’re going to start building a business plan for future events, so the idea of expansion is definitely there. Going back to my earlier point, I think anyone who is raising money always goes for this older generation because at the end of the day, they have the money. But I think there is an entire group of younger people that is being completely missed like myself who want to help and be part of something. If we can target this group in a positive way and show them we are worth supporting, I think we could be wildly successful.